The Evil Game Design Challenge is Casual Connect's answer to the the GDC's long-running Game Design Challenge. "Evil" is used ironically, because the Evil Game Design challenge is about Free-to-Play game design. The 2014 challenge, hosted by Scott Foe, was to turn FTL into a free-to-play game. 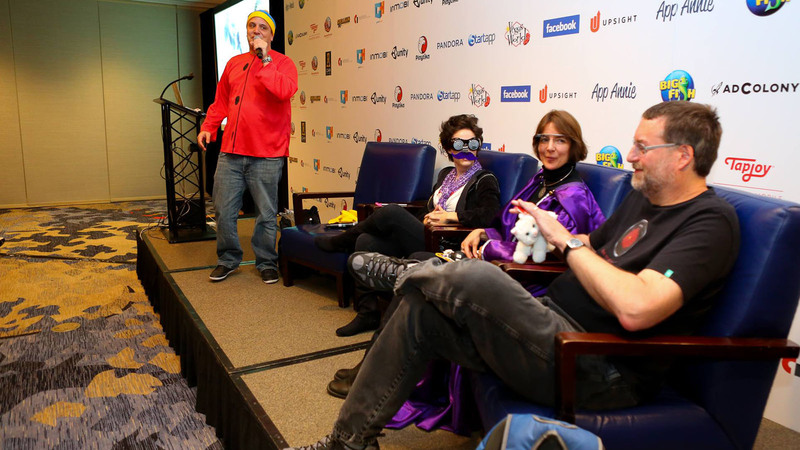 Steve competed against Chelsea Howe (in the hypno-glasses) and Nicole Lazzaro (in the purple robe). And when the dust had settled, Steve had won the traditional Evil Game Design Challenge trophy, a small white cat, which no evil mastermind should be without. The win makes Steve the only one to win both the GDC's and Casual Connect's game design challenges. Last updated: 8-24-2016. Contact boffo@boffo.us.